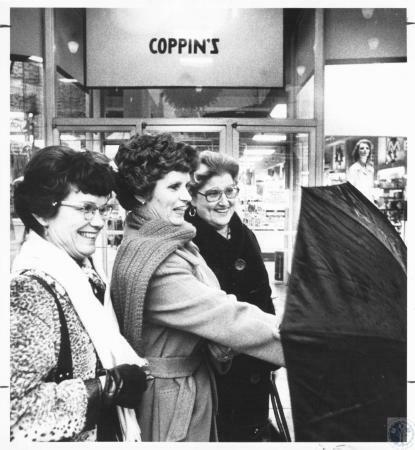 Mrs. Lucille Poetter, Mrs. Evelyn McVey, Mrs. Jackie Linneman entering Coppin’s in 1977. Eight years ago, Jackie retired from her job selling perfume in downtown Cincinnati, and moved into an apartment at Atria Highland Crossing, a senior living facility in Fort Wright, KY. Prior to that move, she had been living in Fort Thomas and was a devoted patron of the Campbell County Public Library system. “I lived just down the hill from the library, and I would walk down our drive. But then when it got a little difficult for me to walk, that’s when I got the walker – just to be able to go to the library! And they told me one day when I went in, ‘Jackie, you can actually get these sent to your home!’ Then, when I got ready to move into here, that was the first thing I asked: could I still have that service?” A Campbell County librarian was quick to get Jackie in touch with the Homebound department at Kenton County. Even as we talked during our interview, she began shuffling through the papers on her side table and then stopped to hand me the most recent compilation of reviews and notes she had set aside for her librarians’ next visit. The activities Jackie mentioned during our chat are another facet of the KCPL Outreach Department. Although she is less social and doesn’t take advantage of library outreach programming, many of our other patrons look forward to the mornings when we come by to help trigger memories and share life experiences. At some senior centers we do trivia challenges, a proven technique for improving and maintaining brain function in older adults. “Trivia games provide mental stimulation, an important component to mental and cognitive health in aging minds. Regular mental stimulation can actually delay the onset of diseases such as dementia and Alzheimer’s, which impair cognitive functioning. Trivia games require memory and stimulate the pathways through the cerebral cortex required to link the question to the image or to the answer.” (Taken from an article by Cheryl Cirelli – http://seniors.lovetoknow.com/Trivia_Games_for_the_Elderly ). We often try to incorporate local interest into our programming, and we are constantly working on new ideas for future programs. Recently we began developing visual-storytelling programs by adapting illustrated books into slideshows. As slideshows, we are able to project the illustrations in a large format as we read the corresponding story aloud. The first story we used for this idea was “A Cincinnati Night Before Christmas”, a children’s book written by Nadine Woodard Huffman and illustrated by Marilyn M. Lebhar. The story is about Matty, a young boy staying with his grandparents in Cincinnati at Christmas, and the readers are exposed to all of the wonderful traditions of Cincinnati during the holidays. After hearing the story and seeing the illustrations, the residents at Covington Ladies’ Home spent nearly 30 minutes talking and reminiscing about their own family traditions during Christmas in Cincinnati and Northern Kentucky. 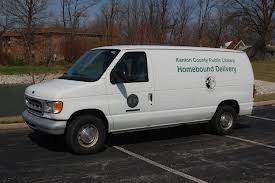 Between our work delivering library materials to individuals and offering chances to reminisce or learn new things, the KCPL Outreach Department does everything possible to make sure the needs of our patrons are being met across the county. 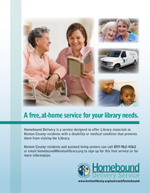 Find out more about the Homebound services and Outreach Programming by calling 859.962.4062 or visiting http://www.kentonlibrary.org/outreach/homebound. Ashlee Brown, Homebound Services Associate, wrote this post.